Planning to Sail Around All Continents? Passing Africa on its south side, around the Cape of Good Hope, is usually called sailing around Africa (as opposed to taking the route through the Red Sea). After we had reached Cape Town on this trip it occured to me that, on a "true circumnavigation", it really doesn't matter wether you pass Africa to the north or to the south. You will have circumnavigated, or rounded, the whole African continent either case! When Scorpio returns to the Caribbean she has completed a true circumnavigation. She has by then also circumnavigated all continents, except America. At school, when I was a kid, we were taught that there were 5 continents on the Earth: Europe, Asia, Africa, America and Australia (which included New Zealand as well). Continents are usually understood to be large masses of land, ideally separated by expanses of water. However, if that would be the case it should be, in principle, possible to sail around a continent or, at least in theory, swim around it. Therefore it appears that continents are generally identified by convention rather than any strict criteria. Europe and Asia are certainly not separated by water - rivers don't count (and they are not continous anyway). However, Africa is not separated from Asia either (and therefore not from Europe) - if the man-made Suez Canal doesn't count. 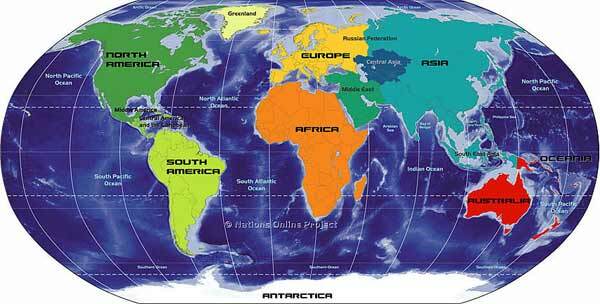 Still it is widely accepted that all three, Europe, Asia and Africa are continents. Some argue that South America and North America are separate continents, but I don't see how that could be. The (also man-made) Panama Canal isn't even an ocean level waterway. Ships have to be lifted by locks almost 30 metres above sea-level to get across the Isthmus of Panama. For historical and cultural and other conventional reasons there is a continental divide between Europe and Asia, but non between the Americas. In my pragmatic opinion there are 6 continents: the 5 mentioned above plus Antarctica. I suppose that, when we were kids, Antarctica was left out because, at that time, it was usually accepted that, by definition, a continent needs to be inhabitated? Anyway, so whats the point, I hear you say. Well, nothing much really, but when reflecting on the criteria for a circumnavigation (see previous story) I started to think about putting continents into the equation also. First conclusion: We have long ago dropped our hook in many places all over the 5 traditional cotinents - well done. But we will never sail to Antarctica (in our own yacht at least); therefore it is too bad that convention robbed us of that credit (visit all continents). Second: If you have aspirations to sail around the world, AND circumnavigate all continents, you have to combine the criteria of a circumnavigation with the convention of the 6 continents. Therefore, to achive this (a true circumnavigation of the Earth and all its continents), you must start and finish at the same point, travel in one general direction, reach two antipodes, cross the equator, cross all longitudes, cover a minimum of 40,000 km WITHOUT transiting the Panama Canal. If North America and South America were separate continents you would have circumnavigated both of them by sailing through the Panama Canal. But as they are one continent, using the canal you only circumnavigate the north or the south - take your pick. Interestingly it doesn't matter if you go south or north of Australia and, for that matter, you can pass either to the north or south of America, Europe, Asia and Africa as well. Does this make any sense at all? Probably not, but thoughts around semantics like this subject often occupy my mind during long night watches. And maybe my conclusions are all wrong? Let's take one more look at the route of a typical modern racing "circumnavigation", an image which we already viewed in the previous story. 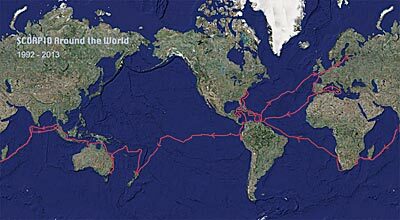 As you can see below, that "quick" route circumnavigates only only one continent: Antarctica. The route of Vendé Globe, a typical yacht racing circumnavigation, is shown in red - its antipodes are shown in yellow. The racing yachts only circumnavigate one continent: Antarctica. Although the total land area of all continents is only about 29% of the Earth's surface, the locations of the land masses seriously limit the number of comfortable routing options for a maritime circumnavigation.